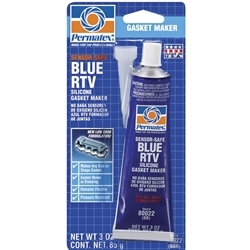 Home → Chemicals → Gasketing → Permatex 80022 Sensor-Safe Blue RTV Silicone Gasket Maker 3 oz. The original Permatex Blue. Will not foul oxygen sensors. Replaces almost any cut gasket. Makes reliable “formed-in-place” gaskets that resist cracking, shrinking and migrating. Coats pre-cut gaskets to increase reliability. Temperature range -65°F to 500°F (-54°C to 260°C) intermittent; resists auto and shop fluids. First generation 1970-1980 gasket maker.